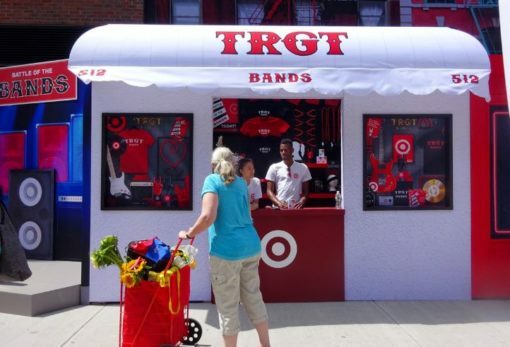 The Target chain has opened a store on 14th Street and Avenue A, and for their grand celebration they have committed what might be the most deplorable commodification of local neighborhood culture I’ve ever witnessed. 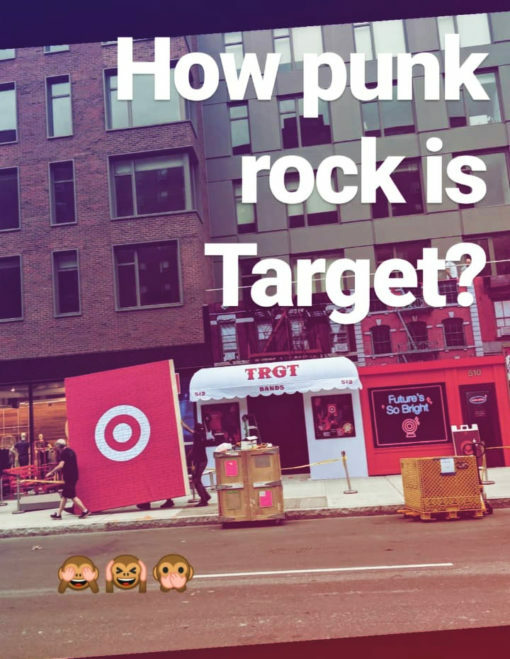 Along the first floor of Extell’s luxury monster, known as EVGB for the Trumpian claim of “East Village’s Greatest Building,” Target has constructed a simulacrum of the hyper-local New York street–the sort of street that is being wiped out by corporations and developers–and it comes complete with all the signifiers. It is part of the larger process of hyper-gentrification, the state-sponsored class takeover of urban neighborhoods in our era of late-stage capitalism. Gentrification long ago stopped being the small-scale, sporadic process it was when first observed in the late 1960s and ’70s. By the 1980s, it had become official policy for making New York friendly to big business, tourism, real estate developers, and upscale professionals. That top-down process has since grown exponentially, glutting the city with luxury developments and chain stores that homogenize the streets and rob New York of its character and variety, as well as its affordability.